Lagenaria siceraria (Molina) Standl. Credit: Wikipedia. (Phys.org) —A team with members from several institutions in the U.S. has finally set to rest the mystery of how the bottle gourd found its way to the Americas. In their paper published in Proceedings of the National Academy of Sciences, the team explains that new DNA analysis has revealed that the bottle gourd made its way to South America by floating over from Africa. For several decades, scientists have been wrangling with the mystery of how the bottle gourd, which is believed to be native to Africa and Asia, made its way to the Americas where it grew wild approximately 10,000 years prior to being domesticated. Some believed the mystery had been solved when a research team using DNA techniques reported back in 2005 that the bottle gourd in the Americas had Asian DNA, suggesting the gourd made its way to North America by early people carrying it across the land bridge that existed between what is now Alaska and Russia. In this new effort, the research team contradicts that earlier finding claiming that newer DNA analysis tools show that gourds in the Americas actually have African DNA, which suggests they made it to the New World by floating across the ocean. To settle the matter once and for all, the researchers analyzed 86,000 base pairs taken from samples, rather than the meager three markers used in the 2005 study. It proved, the team says, that the bottle gourd found its way to the Americas from Africa on its own, grew wild for a time and was then cultivated. To further bolster their claim, the team created a computer simulation of bottle gourds and the waters through which they would have had to travel. The simulation showed it was possible the gourds could have traveled to the ocean via African rivers or streams, then made their way across the ocean via currents to the coast of South America, all in just nine months—a short enough span to allow for the seeds contained within to grow once reaching land. 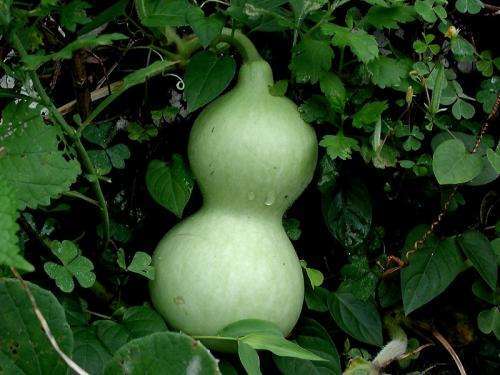 The new research appears to settle the matter of how the bottle gourd got to the New World, but questions still remain, such as how it got to Asia, and why are there so few wild variants of the bottle gourd anywhere in the world today? Bottle gourd (Lagenaria siceraria) was one of the first domesticated plants, and the only one with a global distribution during pre-Columbian times. Although native to Africa, bottle gourd was in use by humans in east Asia, possibly as early as 11,000 y ago (BP) and in the Americas by 10,000 BP. Despite its utilitarian importance to diverse human populations, it remains unresolved how the bottle gourd came to be so widely distributed, and in particular how and when it arrived in the New World. A previous study using ancient DNA concluded that Paleoindians transported already domesticated gourds to the Americas from Asia when colonizing the New World [Erickson et al. (2005) Proc Natl Acad Sci USA 102(51):18315–18320]. However, this scenario requires the propagation of tropical-adapted bottle gourds across the Arctic. Here, we isolate 86,000 base pairs of plastid DNA from a geographically broad sample of archaeological and living bottle gourds. In contrast to the earlier results, we find that all pre-Columbian bottle gourds are most closely related to African gourds, not Asian gourds. Ocean-current drift modeling shows that wild African gourds could have simply floated across the Atlantic during the Late Pleistocene. Once they arrived in the New World, naturalized gourd populations likely became established in the Neotropics via dispersal by megafaunal mammals. These wild populations were domesticated in several distinct New World locales, most likely near established centers of food crop domestication. a more interesting question would be ... How did the plant evolve to be a bottle in the first place? What possible evolutionary value was there to the plant to be a receptacle? Could it be that hominids have been instrumental in its evolution as a tool for a million years? There should have been some effort made to explain what constitutes wild vs domesticated. Does the mere act of planting a seed from a wild gourd qualify it as cultivated, or are there any genetic changes involved? These findings, as presented, seem to be highly doubtful in terms of providing the basis for a definite conclusion. They also ignore -as a matter of course-- the other obvious possibility, which is that they were transported to the new world by seafaring prehistoric Africans, which is just as likely as some lone gourd being carried across the Atlantic and finding some highly improbable fertile ground on the seacoast of South America. If they want to say it was mere chance, then they will need to locate the epicenter where this gourd made landfall and from whence its modern range subsequently radiated, and at the same time detail what distinguishes wild from cultivated.